To make your company appear more professional, RankTrackr provides an ability to white-label your interface and reports. You can customize the name of the tool, logo (used in the interface and reports), and domain. Like other agency features, the white-label interface is supported on Pro and Custom plans by default. You can use any domain or subdomain to mask our default http://users.ranktrackr.com URL. 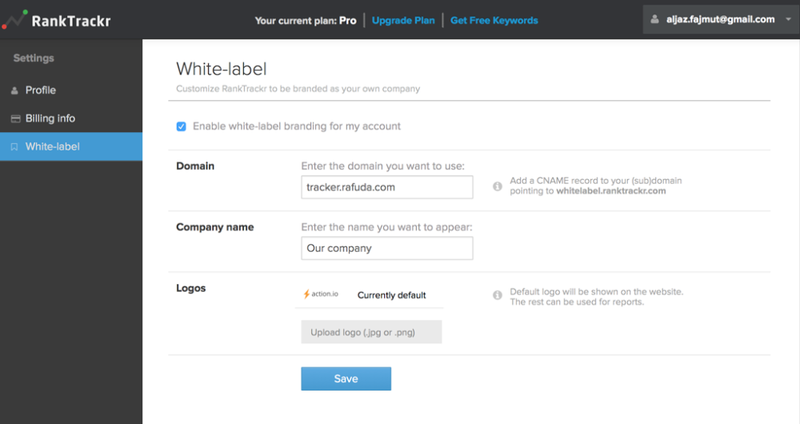 To make your domain work, you will need to set up a CNAME record on your domain or subdomain point to whitelabel.ranktrackr.com. If the new domain doesn't work after you configure it, you should wait a couple of hours that are usually required for the name servers to propagate the change. The setting in "Company name" field will be used as a replacement for the RankTrackr name (in the website title, emails, etc.). You can upload multiple logos. The logo set to default will be used as a replacement for the RankTrackr logo. The other logotypes can be logos of your clients and will be shown as options when exporting the reports. The recommended format for logo is .PDF with transparent background and with 280px width and 50px height size.